So here’s how to find me on Twitter – just click here! 1. Follow the first THREE Twitter Twaffic hosts listed on the linky. Netiquette and courtesy! They’ll reciprocate your love on twitter! 2. MAKE A BLOG POST LIKE I am doing. Copy and Paste these directions. 3. 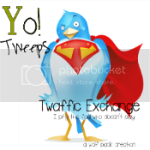 Grab the YO Tweeps Twaffic Exchange Button pictured below. Put him in your post. 6. Now link up your post below in the linky! 7. Visit some other #YOtweeps linkers on the list. 9. If someone follows you JUST reciprocate on twitter. It’s that easy. Thanks for playing YoTweeps with us! I'll follow you too! I'm following you. Still trying to figure out this whole twitter thing! Following your blog and on Twitter throgh SupahMommy Yo Tweeps. I love your header! Fabulous! LOVE your blog! I am now a "follower"
Would you be interested in doing a button swap? If so, email me at megtucker@comcast.net and we can set it up! I own a blog/design/scrapbooking/photography/WAHM forum I'd love you to join called My Great Retreat (link is below). Can't wait to keep in touch!